Whether your main priority is to reduce the risk of internal fraud, or to make sure that your next audit goes well, you need an efficient and reliable way to pinpoint weaknesses in your JD Edwards World security. Auditing security can be very complex, time-consuming and painful. Unfortunately, it can also fail to give you accurate information or clear answers to help you satisfy your auditors or improve your security. 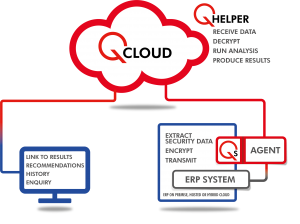 Our QCloud Audit as a Service enables you to conduct a security audit of your JD Edwards World system whenever you need it, without any demand on your technical team. You request an audit via the QCloud portal, then download the QCloud audit library and Q Agent, which gathers the information needed, such as the live Security table, User and Role information, then pushes it to QCloud. The data is analyzed and the audit report is produced. An email is sent to notify you that the results are ready, including links to access and download the consultancy report via QCloud. An interactive view of the audit results is available online. We then set up a call where a Q Software consultant talks you through the findings. We discuss priorities and make recommendations for improvements. You can also view previous audit reports and graphs comparing the results of your audits, highlighting trends and areas of improvement or degradation. The reports provide valuable information to help you make informed decisions about your security and priorities for improvements, where relevant. Users with Segregation of Duties violations. The audit analyzes and reports on your live security, so results are accurate and current, rather than based on data exports. The results shows a wealth of factual information such as users with access to critical programs and users with Segregation of Duties conflicts. Recommendations are included to help you prioritize remediation work. The audit report provides evidence about the status of your security and the detailed reports make it much easier to answer auditors’ specific questions. The service is available to any JD Edwards World customer – you don’t need to install Q Software applications to use it. You only need to download the QCloud Audit Library and the Q Agent to gather the data. The audit library is restored to your IBM server but does not require installation. A batch job generates the raw data and the Q Agent sends that to QCloud for analysis. The first time you run an audit, you will receive an email with instructions on how to download the Q Agent from QCloud and configure it to run on your system. This is the only part of the process that needs technical assistance and takes around 30 minutes.